Flow batteries store energy in ions in solution, using elements that have multiple valence states (differing numbers of electrons). In comparison, lead acid batteries store the active element (lead) in solid form, either as metallic lead, or as lead oxide and lead sulfate. Degradation occurs on the solid-liquid interfaces in these batteries, resulting in a finite lifetime. Because flow batteries have no solid-liquid interfaces to degrade, they have a much longer life than other batteries. Flow batteries are constructed much like fuel cells, where ions are exchanged through a membrane, driving an external electric current. The electrolyte is stored in large tanks, and pumps move the electrolyte past the membrane. This allows the decoupling of power output and storage capacity that is found in most other batteries: a flow battery can be designed to provide a specific power output (by determining the membrane surface area and electrolyte flow rate) and specific capacity (the size of the electrolyte storage). Flow batteries usually have low power density, which means it takes a lot of fluid to provide significant capacity. Pumps and power electronics are the typical weak links. 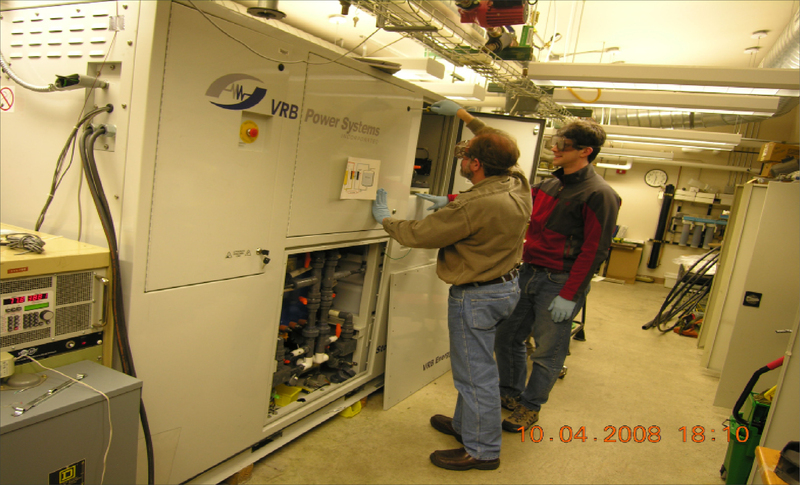 Most flow batteries also have fast response times and can be sized to meet a specific need. Depending on the electrolyte type, flow batteries must be kept at a relatively constant temperature. The low self-discharge rate and ability to decouple power and capacity would allow flow batteries to be used for longer, multi-day, or even seasonal storage. The Prudent Energy battery (formerly VRB for Vanadium Red-ox Battery) is one type of flow battery. Vanadium has four valence states (+2,+3, +4 and +5) allowing a battery that uses only a single chemical type, which eliminates the chance of the active ingredients mixing, or cross contamination. Cross-contamination could cause accelerated degradation of the battery, or could weaken the active materials, negatively affecting the battery’s ability to hold charge. This technology is currently in the precommercial testing phase, and has a number of small units being tested around the globe. The University of Alaska Fairbanks tested a VRB unit for two and a half years. Several of these flow batteries have also been demonstrated in remote applications, most notably in a wind-diesel project on King Island off the coast of Australia. Kotzebue Electric purchased this type of battery designed and built by Premium Power of to operate in conjunction with its wind farm. KEA’s goal for the Flow Battery Energy Storage Systems project is to analyze and demonstrate flow battery systems and their potential for energy storage in rural wind systems, however the battery was damaged during shipping, and due to poor manufacture design, repairs have proven impossible without returning the unit. Other flow batteries types include sulfur-bromine and zinc-bromine systems. These share most of the same basic properties except they use a different element on the anode and cathode sides, and are subject to cross contamination, which eventually requires replacement of the electrolyte. These batteries also remain in the pre-commercial stage. The sulfur-bromine system was being marketed by Regenesys, but this company failed after the collapse of a demonstration project in the United States. Zinc bromine systems are being developed by Premium Power and by ZBB, both US companies. If robust systems can be developed at current projected prices, these batteries could provide sufficient electrical storage for wind-battery hybrid systems in Alaska.